Tolcap is good news for engineers, designers, manufacturers and accountants! Quality costs are far more than merely the value of scrap materials, returns and shop floor time spent on reworks. Just think of all the time and effort also put in by design, quality and manufacturing engineers, analysing and solving production problems - when they should be working on the next generation product! Sales people, Management and Directors frequently get drawn in too. So it's not surprising that quality costs can absorb as much as 20% of turnover! When the problems are analysed, up to 50% of errors are directly attributable to incorrect allocation of tolerances before the manufacturing process even started - essentially, getting the tolerances wrong at the design stage. 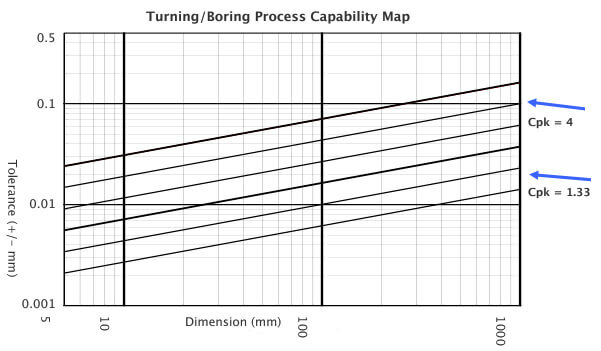 Process Capability links the tolerance required by the Designer to the mean & standard distribution achieved by the Manufacturer of the part. For a centered distribution, divide the tolerance range by six standard deviations (6 x sigma). This is Process Capability or Cpk. Designing to process capable standards guarantees right first time manufacturing tolerances. "Design for Six Sigma" essentially says you should ensure tolerance limits are +/- six sigma from the mean of the prototype batch. This allows the mean to drift over time and if the drift is less than +/- 1.5 sigma (easily checked with an appropriate control chart), then Cpk should stay at 1.5 or better over time. Most clients accept a Cpk better than 1.33 over time and Tolcap maps highlight that capability. "Can you make this part?" If the design is good then all is well. But if the design is a problem, then you'll pay a heavy price and it'll be a problem for your current and any alternative suppliers too. 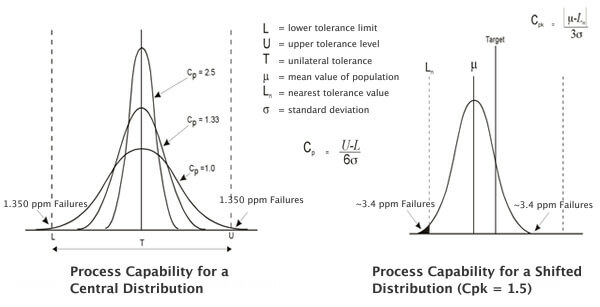 So use Tolcap to predict process capability and share the prediction with your supplier. Tolcap brings sanity and a shared problem-solving approach to replace combative supplier discussions. Tolcap provides capability maps for over 80 different manufacturing processes helping you pinpoint the most efficient production method by examining alternatives for cost and capability. Tolcap asks you for a dimension and tolerance and returns a predicted process capability. The maps assume good practice in manufacturing operations and a design with no specific limitations set by material or geometry. Tolcap application wizards then take you through modifications to the prediction as you specify the material of the part and answer some questions about its geometry and the particular implementation of the process. Tolcap also allows you to assign a dimension and a required capability enabling you to find the tolerance you can expect to allocate. Let's say you have a "stack" of dimensions where parts fit together, it is important to know if the stack is capable. This does not mean just looking at the tolerance stack but understanding the effect of capability of the individual components. This is critical, irrespective of whether you are doing a 'statistical' or 'worst-case' investigation. Tolcap enables equal process capability of the parts, which also ensures minimum defects.